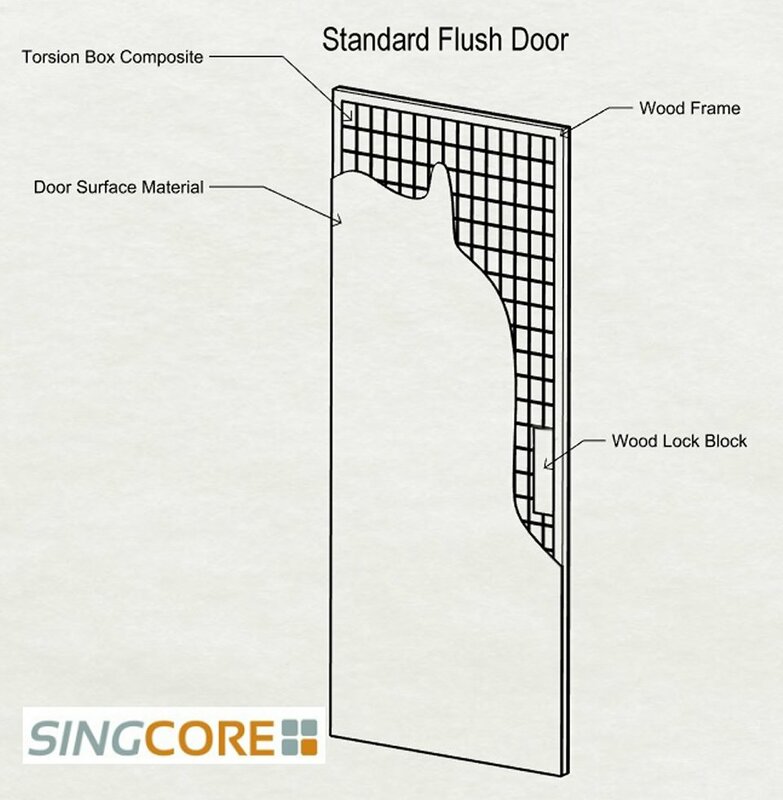 Standard Sing Core pre-hung doors are manufactured with patented Sing Core material as the base interior substrate of the door. The Sing Core substrate material is created using a vertical grain natural wood torsion box design while the traditionally empty voids are filled wall to wall with recycled foam. The standard foam material is recycled rigid EPS foam. A 10 inch natural wood lock block is positioned centered at 37 inches for door knob and locking mechanism placement. The core material is wood framed by 1.5 inch natural wood for finishing strength and attaching hardware. The torsion box is completed by adhering an exterior surface material (skin) in your choice of marine grade plywood, fiberglass (FRP) or aluminum. Bonding agent used in adhesion of the entire composite material is formaldehyde-free. Standard Sing Core Pre-hung Doors include frame perfectly suited for the door of your choice and ready to hang. Specify either 2×4 or 2×6 wall thickness to determine frame size for door installation. Every Sing Core manufactured door is finished to specifications and guaranteed for 10 years for structural integrity. 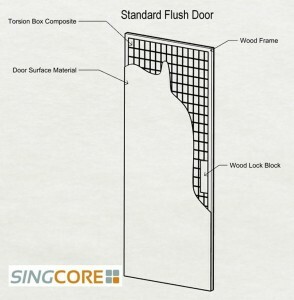 Product Description: 1.5” or 2.25″ side-hinged door panel manufactured by Sing Core with frame, pre-hung. Facings are your choice of marine grade plywood (1/4 inch), 0.09 fiberglass (FRP) or aluminum (.62). Interior Blocking: Solid wood implant is inserted for door knob and/lock block hard points. Delivery: Reasonable care is taken to ensure safe transportation of your Sing Core door from factory to door shop for finishing and pick-up or deliver to your location. Finishing: The standard finishing and sealing of the Sing Core pre-hung standard door includes Marine grade plywood is paint grade, fiberglass in pre-primed, and aluminum is untreated. Additional finishing options include your specifications at additional charge. Insulation Performance: Standard Sing Core doors feature built-in insulation value with an R3 rating per inch. Acoustical Performance: Sing Core standard doors have a natural sound-deadening quality for noise control. Standard sound transmission class (STC) is 30*.